Ezekiel describes the Structure of the Altar in the Future Bait Hamikdash and its dedication ceremony. The connection of the Haftorah to the Parsha: The Torah portion discusses the Building of the Mishkan, Tabernacle. It also deals with the sacrifices that were brought in the Mishkan. The Haftorah of Tetzaveh contains the prophet Ezekiel’s description of a future Bait Hamikdash. Most commentators believe that Ezekiel is talking about the Third and Final Bait Hamikdash, Holy Temple, and not the second temple known as King Herod’s Temple. Introduction: Ezekiel has a prophecy where he “sees” the divine presence re-entering the Holy Temple. This takes place 20 years after Ezekiel had the prophecy of the “Ma’aseh Hamerkavah” or that of Hashem’s throne lifting itself up and out of the first Bait Hamikdash. 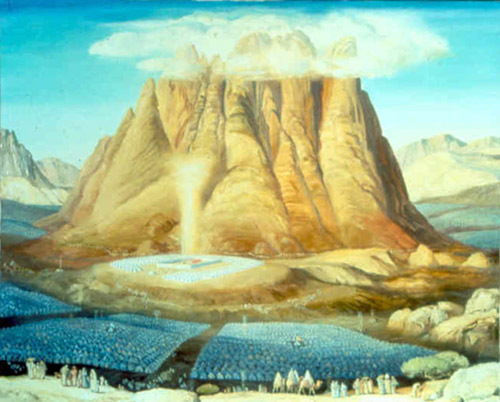 He is about the experience the vision of Hashem’s presence returning to the Holy Temple. The storyline of the Haftorah: Yechezkel is commanded to reveal the plan of the future Bait Hamikdash. The Bait Hamikdash will stand on the top of the mountain Har Ha-Moriah or Mount Moriah adjacent to Jerusalem. The Bait Hamikdash was set away from the city of Jerusalem. No one lived in the area of the Bait Hamikdash, except the Kohanim that lived in the Temple. There were large “Springing” arches that lead from the city over the valley and into the Holy Temple. They were called “Springing” arches because they “sprung” out from the temple walls. These are the measurements of the Mizbaiach for animal sacrifices. It was measured in “Amot” or approximately 18 inches. Then an “Amah” could be broken down into 5 or 6 “Tefachs”. The altar had three different widths. Its base was wide, then narrow, and then wide again. The Mizbaiach stood about 20 feet in the air. The first level, which was called a Tefach, was the base. Then in the middle of the Mizbaiach was an indentation with a catwalk for the Kohanim to walk around. Then there was the top of the Mizbaiach. It was four feet from the Mizbaiach to the courtyard. The width of the Mizbaiach was two feet. There was a pathway that leads from the city to the small courtyard for the Leviem. There was a second pathway into the great courtyard for all others to enter. At times 100,000 people were found standing in it. 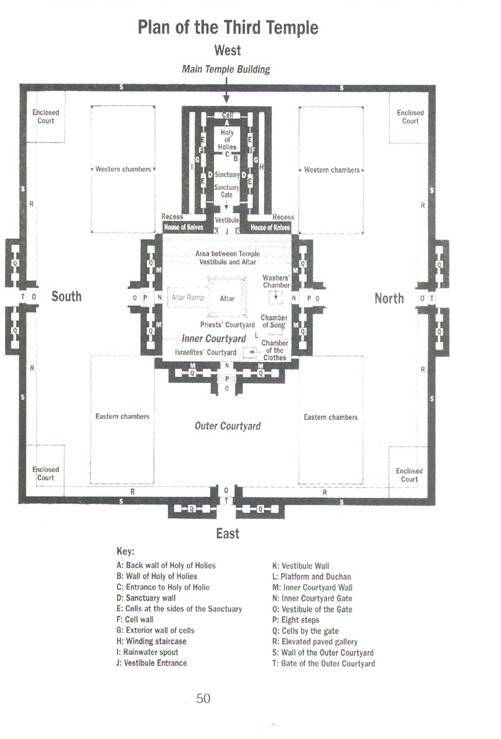 There was a third elevated courtyard which served as the women’s section, a concept copied in many synagogues today. At the top of the altar there was a Ner Tamid (The Eternal Flame) burning. In the time of the First Bait Hamikdash the flame burned in the shape of a crouching lion. It was known as the “Ha-Ari-el” or Hashem’s lion, the symbol of the House of David. That area, where the fire burned measured 4 "Amos", and each corner was built up two feet high. The top of the altar was perfectly square. The small courtyard was approximately 28 feet by 28 feet with a fence around it about 18” high. The structure of the future Bait Hamikdash and the altar for animal sacrifices. The altar’s dedication ceremony and its sacrifices to be performed. The Leviem and Kohanim, which are from the tribe of Levi will participate in the future re-dedication of the temple; specifically, the descendants of Tzdok, who were the only loyal family from the Kohen Gadols. They will be the only ones who were eligible to perform the sacrifices in the future Bait Hamikdash. They will bring an ox and sacrifice it on the four corners of the altar. There was also a stairway up to the altar. It will be cleansed with the sprinkling of the blood from this animal. Then the Kohen will burn the animal’s carcass outside the Bait Hamikdash. On the next day, they brought a goat, and they used its blood to sprinkle on the altar. The Kohen will cleanse the Bait Hamikdash with this ritual. Then the Kohen will bring a sacrifice and salt the animal. Salt was a symbol of preservation, refrigeration, taste and of life itself. We remember the altar in our homes, at out table, by salting the bread after we say the blessing of “Hamotzie lechem min ha’aretz”. One is actually supposed to dip the bread into the salt 3 times. Salt was very valuable in those days and as a matter of fact, similarly to the “Besamim” or incense boxes, that we use today, during Havdalah. It was customary to make silver “towers” to hold the salt in those days. The seven-day dedication service. For seven days the Kohanim will offer this offering and remove any sins from the temple. They will complete 1 week and then begin on the 8th day to offer the Sacrifices called the “Olah" and the “Shelamim”. The Haftorah concludes with the phrase “And I will accept you, so says Hashem”. The meaning of his name is "Hashem strengthens" or may Hashem strengthen. Was a Kohen, born in the village of Anatot surrounding Jerusalem. His wife died suddenly before his prophecies began. Ezekiel was a part of the 8,000 exiles in 597 b.c.e. to go to Babylon. His prophecies lasted for 30 years. Several of the prophecies are date, month and year specific. He was the only person in the Tanach (Bible) to be called "Ben Adam” The son of man. Famous Phrases: Ezekiel 38:23: “V’hisgadalti V’hiskadashti”. Or now rephrased as “Yisgadal V’yiskadash”. “And I will be exalted, and I will be sanctified” The prayer of Kaddish got its start from the words of Ezekiel. The Prophet. Haftorahman’s lesson of the week: This week’s Haftorah is an example of Hashem’s showing us His “game plan” for the future. He is dangling a proverbial spiritual carrot stick in front of us to follow into the days of the Mashiach, which will begin the time of the third and final Bait Hamikdash. Timeline: This Haftorah took place after the destruction of the 2nd bait Hamikdash, approximately in the Jewish year 3352, 2409 years ago.